Almost every single loan generated to buy a home contains a due on sale clause. This clause is important if a homeowner wants to sell the home without paying off the loan. A due on sale clause allows the existing lender to call the entire loan due and payable if the homeowner transfers title to the home without paying the loan in full. A due on sale clause basically prevents a homeowner from selling subject to an existing loan. It doesn't mean that people don't try to do it but it does mean the new homeowner might lose the home if the existing lender forecloses. Lenders have specific rights, and trust deeds and mortgages are written by lawyers in favor of the lenders. Transfer of the Property or a Beneficial Interest in Borrower. If all or any part of the Property or any interest in it is sold or transferred (or if a beneficial interest in Borrower is sold or transferred and Borrower is not a natural person) without Lender's prior written consent, Lender may, at its option, require immediate payment in full of all sums secured by this Security Instrument. However, this option shall not be exercised by Lender if exercise is prohibited by federal law as of the date of this Security Instrument. The reason you care about a due on sale clause is because you don't want the lender to suddenly demand a payoff, which the lender has the right to do. However, in the real world, lenders are not often calling loans due and payable simply because the title to the property was transferred. Especially during the market collapse between the years of 2006 and 2011 because lenders at that point were simply thrilled to be paid at all. The lenders didn't exactly care who paid them as long the mortgage was not delinquent. Fast forward to today, and lenders still have the right to accelerate the loan if they feel their security could potentially be damaged. After all, they made the loan to a borrower after fully vetting the buyer and running the file through underwriting and who is this new person they don't know making the payments. The question is will they? 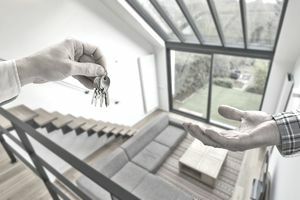 Generally, a due on sale clause is enforced if the lender feels its security is at risk or if the lender believes it can make more money in a climate of rising interest rates. For example, if the bank can enforce a payoff of that existing loan, which might be at a lower-than-market interest rate, and then use that money to fund a new loan at a higher rate, it is in the bank's best interest to call that loan immediately due and payable. This could leave borrowers scrambling to refinance. Back in the old days, like the hey-days of the 1970s and 1980s, banks would offer formal loan assumptions to new buyers, but we don't see much of that anymore. If buyers did not qualify, these types of buyers would often try to buy the property without informing the lender, either wrapping the existing financing into an All-inclusive Trust Deed or a Wrap-Around Land Contract. Some used lease option sales as a financing instrument to try to sidestep the due on sale clause.